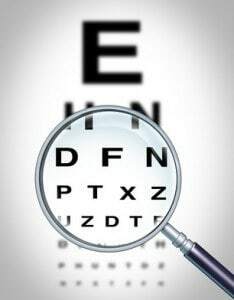 Loss of vision has many possible causes and can be temporary, permanent, partial, or complete. For most people, losing their vision, even partially, is a frightening experience. Depending on the type of injury and what is causing the loss of sight, there can be options for treatment as well as many aids to help people function without their vision. Each Chicago eye injury attorney at Rosenfeld Injury Lawyers appreciates the significance of an eye injury lawsuit, and we work hard to make sure that each of these clients receives the eye injury compensation they are entitled to under Illinois law. Contact our office for a free consultation and we can get started on your case. Injuries to the eye or brain can cause significant problems with vision. Since the eye is an extension of the brain, even if the eyes are functioning correctly, if the brain is injured and cannot process the information, sight can be lost. For vision loss, the first course of treatment is finding the underlying cause. In the cases of diseases that are degenerative in nature, treatments are available, such as laser surgery, prescription medicines, and the use of vision-enhancing devices. However, in the case of eye or brain injury, there are few options when it comes to treatment. Surgery: Retinal detachment and some other injury-related causes of vision loss could be corrected by surgical intervention, but it is not always an option. Therapy: Although many traumatic injury vision losses cannot be corrected, there are therapies that can help patients maximize their vision. Traumatic vision loss can be difficult to treat and can range from slight vision loss to complete blindness. New therapies are being tested using stem cells and other medical procedures that have shown promising results to treat injury and degenerative vision loss. For those who have sudden vision loss from an injury or accident, learning to cope with diminished sight or even blindness can take time. Vision problems not only affect what the person is able to see, but they can also cause dizziness and balance issues. Some vision issues from injuries such as ocular trauma may lessen over time. When trauma causes blindness, the victim will need therapy and assistance learning to live with their disability. Commonly, many will learn to read and write using the Braille system. To be able to navigate while walking, using a cane may be necessary, and many can be greatly assisted by the use of a service animal. Advances in technology such as audio assistance devices have made communicating through phones and computers easier as well as providing alternatives to using Braille to read. Whatever the cause, vision loss is a serious and possibly life-altering medical issue. Anyone who experiences any changes in vision, especially after a head injury, regardless of how slight, should immediately seek medical attention. Eye injuries are some of the most significant types of personal injury cases we handle. Aside from the daunting task of learning how to cope with vision loss, there are many emotional components to these injuries that deserve to be addressed. As skilled Chicago eye injury attorneys, the experts at Rosenfeld Injury Lawyers believe that we have a responsibility to each client with a vision impairment to address all aspects of their injuries to ensure that they can have the best quality of life possible following an accident. In some eye injury cases, we will consult with a life care planner who can suggest accommodations to both improve the client's quality of life and assist in conveying the nature of these injuries to a jury. Rest assured that we will fight to make sure you receive fair eye injury compensation. As with all significant injury cases, we invite you to speak with our accident lawyers by phone or meet with us in person to see if our team is a good fit for you.